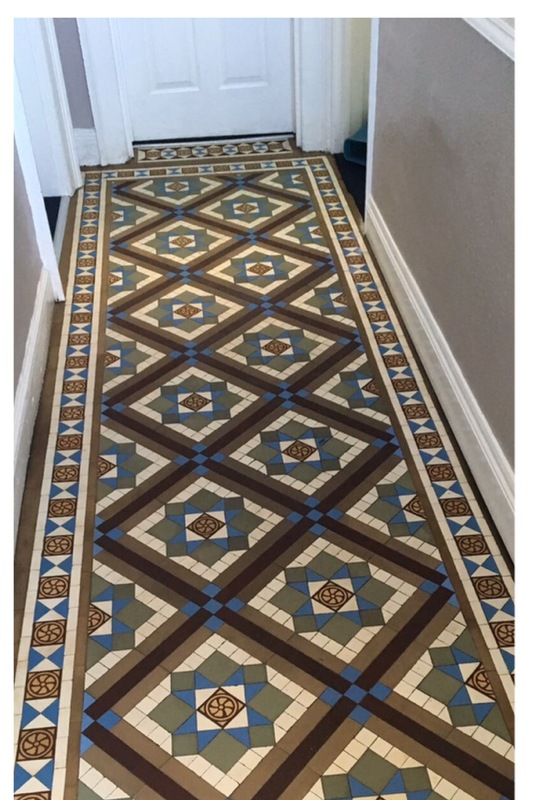 Here we have a small Edwardian Tiled Hallway located in a busy office building in the market town of Newark in Nottinghamshire. We were asked to come over and inspect the floor for renovation. Our subsequent survey highlighted inherent damage, historic wear and staining as well as salt staining from efflorescence. On top of that there were some loose tiles along a door threshold that would need fixing. Keen to get the floor restored we were given the approval to start the work and agreed on a date to return. On our return we started by lifting the loose tiles and cleaning up the recess of debris before re-fixing the tiles using fast setting adhesive & grout. Within half an hour the tiles were set and we were able to start our intensive cleaning process. 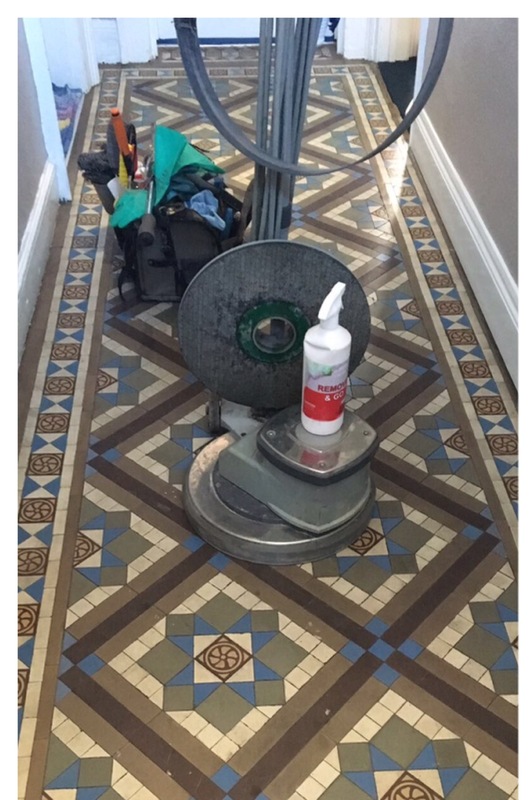 The first part of the cleaning process was to apply a strong dilution of Tile Doctor Remove & Go coatings remover allowing it to dwell and soak into the tiles for thirty minutes. The solution was then agitated using a black scrubbing pad to help break down the historic-soiling that had been hiding the original colour of the tiles and also remove any old sealers. There were paint spots and adhesive residues on the surface of the tile which we were now able to scrape off the after being softened by Remove & Go. The resulting slurry was vacuumed away and the floor was cleaned down with water to remove the suspended soils and cleaning product residues. To deal with the salt staining Tile Doctor Acid Gel was liberally to the tiles and left to dwell for a long time in order to neutralize both the cleaning residues and to dissolve the efflorescence salts. We had warned the customer that because efflorescence salt staining was present it was a likely indication of inherent moisture under some of the tiles and we were able to confirm this with the use of a damp meter. It worth noting that these old floors did not have damp proof membranes installed and were designed to allow moisture vapour to pass from the sub floor to the surface of the tiles. Under normal use this was manageable by the Victorians & Edwardians. Unfortunately since that date a lot of these floors have at some point been covered by other floor coverings such as modern hard floors or carpet etc. This causes a build up of moisture to develop and efflorescence to form. Over time this causes crystalline salt capillaries to form a foothold in the tile causing damages that can affect the tiles physically as well as a loss of colour. Once the tiles were cleaned of Acid Gel and rinsed with water again to remove any trace of product the floor was then dried as much as possible with a wet vacuum to remove moisture. After leaving the floor to dry off overnight I came back the following day to apply a sealer which would protect them from staining, ingrained dirt and make them easier to clean and going forward. Knowing that efflorescence would be an issue I had already decided to use a fully breathable sealer to aid moisture transmission from the sub floor. In this instance we used our low maintenance Impregnating sealer Tile Doctors Colour Grow applying 3 coats to provide long term protection to the floor. The work took us two days to complete and before leaving our customer was given instructions on how to clean the floor in future using Tile Doctors pH Neutral Floor Cleaning Solution which is highly effective on soiling but most importantly it’s not acidic and so will not damage the integrity of the sealer. It’s worth pointing out that many household cleaning products, and also high-street branded cleaning products, can quickly damage floor coatings; they can also leave residues on floors that contribute to rapid re-soiling.